In simPRO, an invoice is a list of goods sent or services provided and the sum due for these from your customer. After you have approved , emailed, and received payment for an invoice, you can apply the payment to the invoice in simPRO. You can also raise customer credit notes against invoices in simPRO to record credited or voided invoices. Learn more in Credit Notes. Click to view the Invoice Types diagram below to learn which invoice is applicable for your different projects. To set up how your invoice forms appear when you email them to customers, see Invoice Forms. You can also see Requests for Claim to learn how to set up how your requests for claim appear. US only: If you use simPRO in the United States, the terms 'progress invoice', 'deposit invoice' and 'final invoice' are used instead of 'progress claim', 'deposit claim', and 'final claim'. Please ensure your job values are accurate and up to date prior to invoicing. Once you have created an invoice, you can only adjust values by beginning the audit process and voiding the invoice. Update a job that is ready to invoice. Click Save and Finish. And, Invoice Job. Go to Jobs > Pending / Progress / Complete, then click Options > Create Invoice on the job you wish to invoice. If you have already raised a progress claim against the job, click Options > Create Progress Claim. Go to Jobs > Pending / Progress / Complete Jobs. Select the check boxes for each job you would like to invoice. The selected jobs are invoiced under the same invoice in Invoices > Unpaid. The Job No. column displays all jobs on the invoice. When you email a consolidated invoice to the customer, select the Consolidated Invoice form in the Forms tab. This form is designed to show multiple jobs on one invoice and can be customised in your invoice forms setup. Learn more in Set up consolidated invoice forms . To learn how to claim the final claim rebate if you had retention withheld on a job, see Retention Claims. If you have selected Restrict Unapproved Invoices in System Setup, invoices must be in the Approved stage before they can be emailed to the customer, paid off, voided, or credited. If you have not selected Restrict Unapproved Invoices, invoices can be emailed to the customer before they are approved, but you must approve the invoice before applying payments. To automatically approve invoices upon creation, go to System > Setup > Defaults > System > Invoices > Invoice Stage and select Approved. Alternatively, select Pending to require them to be manually approved by an employee with the correct security group permissions. Under Invoice Stage, select Approved. To learn more about using form builder templates, see Form Builder Templates. Click the Forms tab in the invoice. Select the form you wish to send from the Templates list. See Assign form templates to appear when emailing a customer invoice / Assign form templates to appear when emailing a request for claim to learn how to update the forms that appear here. Click View to preview and / or print the form. Select a Primary Contact to address the form to and click to add additional Contacts if required. This is automatically populated by the primary contact for invoicing defined in the customer card file. Alternatively, you can manually enter email addresses and separate them with a comma. Note that emails are restricted to a maximum of 20 email addresses . Adjust the default Subject and Body template if required. See Set up the email template for customer invoices / Set up the email template for requests for claim to learn how to update this template. Alternatively, click Clear Email to enter a new Subject and Body, or select a script from the Insert Script drop-down. Learn more in Scripts. Click Send > OK > OK.
A log entry is then created in the Log tab, where you can view the email text and any form attachments. If you need to send multiple invoices, use the Aged Receivables. Select the customers you want to email a statement to and click Email in the footer options. It recommended that you do not generate .docx when you click View as it allows you to alter the invoice outside of simPRO. This can cause errors within your accounting system and impact reporting. Click the Log tab to view a history of actions in that invoice, along with the logged-in employee who performed them and the date and time. When you email from within the invoice in the Forms tab and click Finish, a log entry is created with a icon. When you hover over the icon, the email text appears. When you click the icon, a pop-up containing the email text appears. 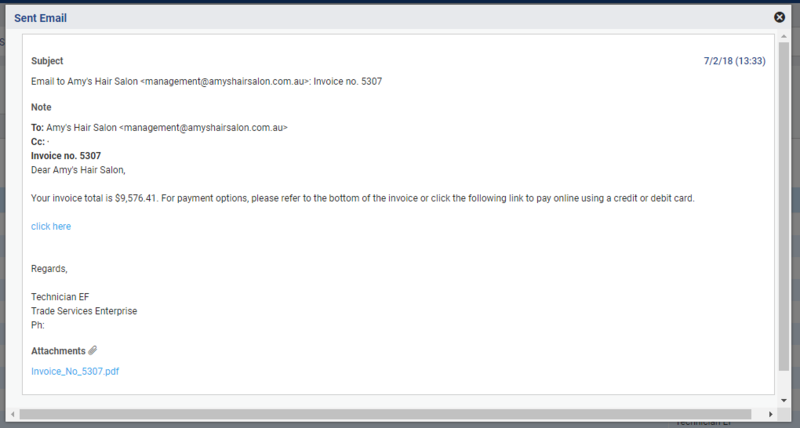 If you emailed an invoice form, it is available to view as a PDF under Attachments. Invoices in simPRO has a value of 2 decimal places. Numbers between zero and four round down, and numbers between five and nine round up. The invoiced value on a job is the sum of each invoice, which means that the invoiced value on the job and the actual total of all invoices may not be the same. For example, a job may have a gross percentage profit calculated at 23.50933%. In the job summary, this value would display as 23.51%. Each individual item in a job or invoice is rounded after markup has been applied. They are then added together, meaning the total value does not need to be rounded. For purchase orders, only the total is rounded after all individual items have been added together. Your tax may or may not be included in the rounding, depending on your Financial Defaults. Learn more in Financial Defaults. Try Walk Me Through, our step-by-step guidance tool, to create invoices. In simPRO, go to Help > Walk Me Through and search Invoice a Job (ID: 84960).